Did you know that the vast majority of consumers buy organic foods because they think it means they are pesticide free, even though farmers use pesticides on organic crops all the time? You may be one of those people but it’s important to know that there is a BIG difference between organic, low impact, environmentally friendly, resistance-free (most of them), natural “pesticides” used on organic crops compared to the much more toxic, synthetic, persistent, systemic kind of pesticides used in conventional cropping systems. To keep up with consumer demand and standards, it would be impossible for organic farmers to provide the quantity and quality of food consumers expect without using organic pesticides. 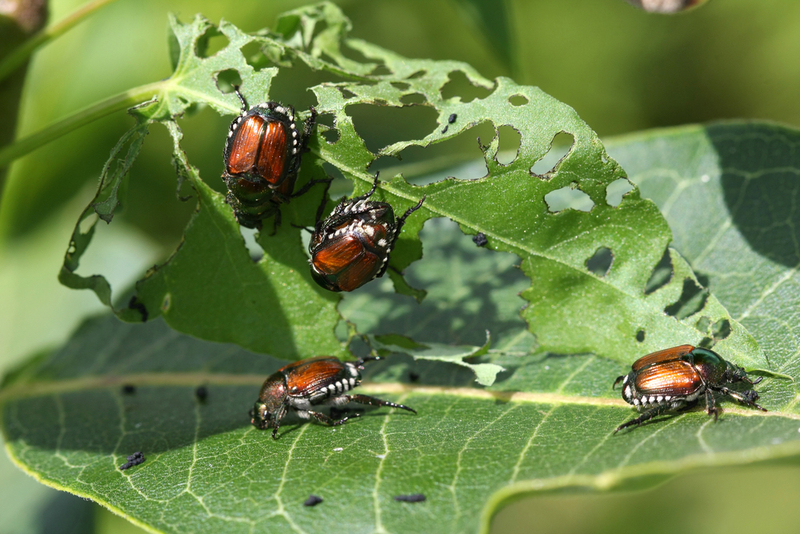 The fact of the matter is sometimes insects and other pests can be very destructive and will destroy a crop or your garden and intervening with some sort of pest control measure is necessary. 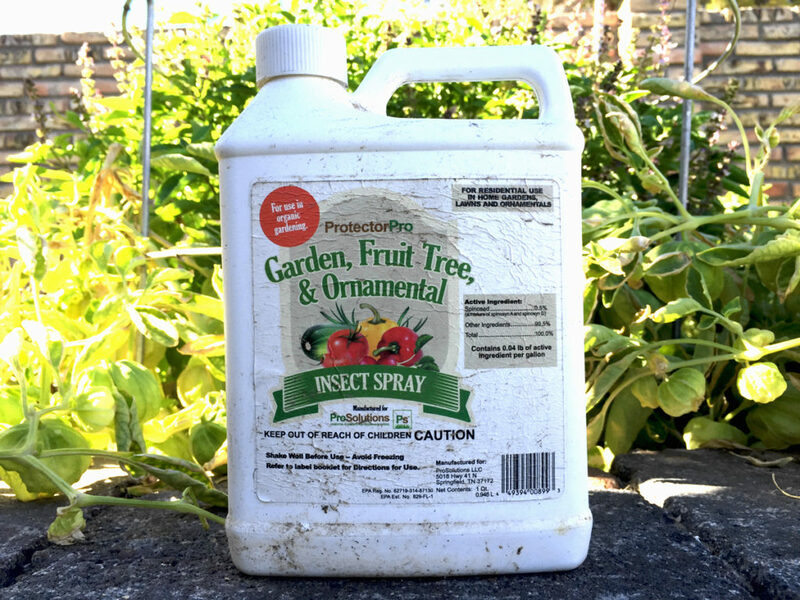 Depending upon the pest and plant, in my own garden I don’t mind taking a little bit of plant damage and I recommend not to apply any sort of pesticide, organic or not, unless you absolutely have to. Ideally, in a productive garden ecosystem you’ll find a healthy mixture of both problem insects and beneficial insects that help keep the “problem” insects under control. Diatomaceous earth, or DE, is a dust made of the fossilized remains of single celled phytoplankton called diatoms. DE is a natural mineral and is used in a variety of ways but it is also a great organic pesticide. To learn other ways diatomaceous earth can be used in your home and garden, check out my post Diatomaceous Earth is DYNAMITE! Diatomaceous earth is a fine, chalky, fluffy powder that looks a lot like flour. 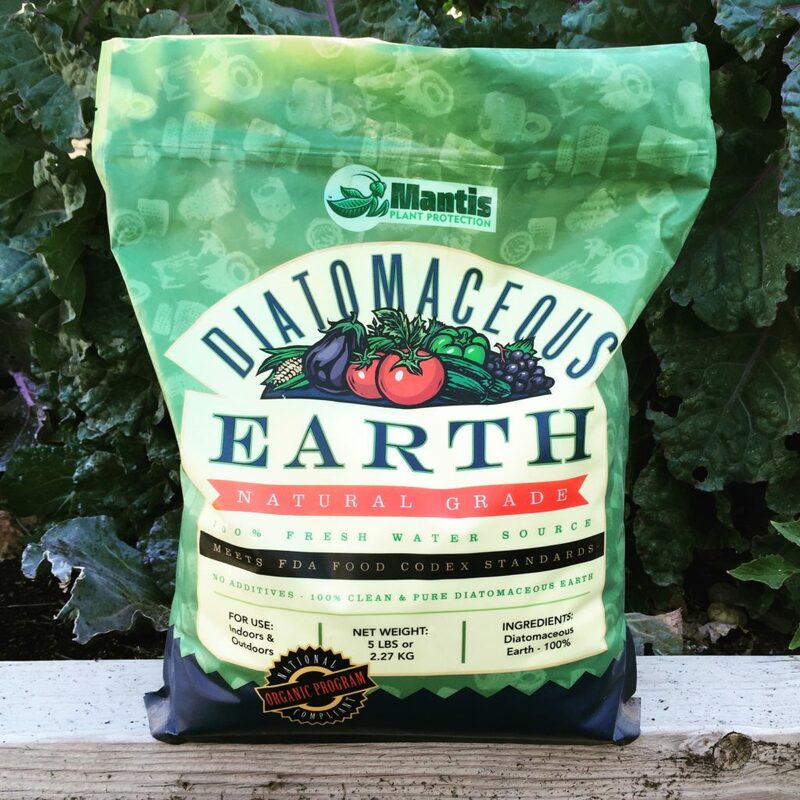 I like to use diatomaceous earth (DE) as a first line of defense against pests like aphids, thrips, spider mites, ants, crickets, and other crawling insects. When applied either in solution with garden sprayer (½ to 1 cup per gallon water) or dry using a duster, DE is one of the most persistent organic pesticides providing residual plant protection up to 10-14 days as long as it doesn’t rain or get wet. 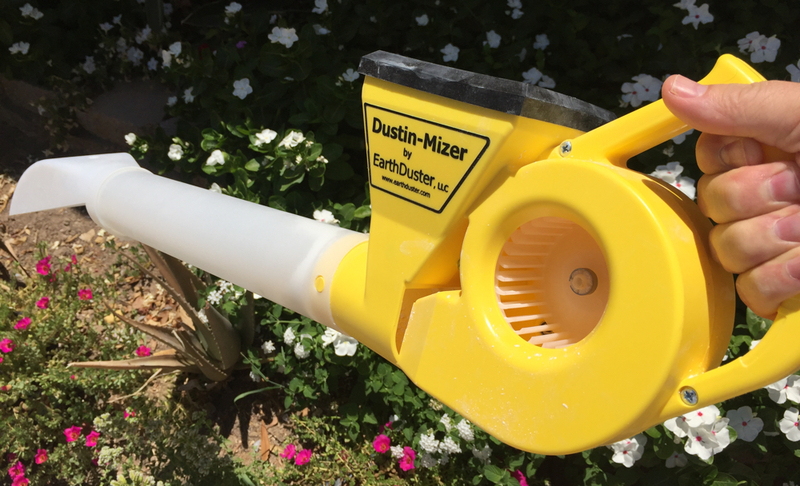 Here’s a mechanical, hand-cranked duster I use to apply DE in my garden. Diatomaceous earth works as a natural pesticide by dehydrating insects and spider mites through a contact desiccation mode of action. The absorptive properties of DE easily remove the cuticle’s outer waxy layer which results in the loss of an insect’s ability to maintain proper fluid levels, ultimately resulting in death. *Not all DE’s are structurally the same and this is why it is important to use a DE with high surface area and porosity for optimum insecticidal activity. IMPORTANT: make sure you use DE that meets FDA Food Codex Standards and contains less than 0.1% crystalline silica content. DO NOT USE POOL-GRADE DE. DE can also be useful controlling pests that reproduce in the soil (e.g., fungus gnats) or crawl over soil to get to plants like snails and slugs. (However iron phosphate baits, also organic, work a little better for these slimy pests). 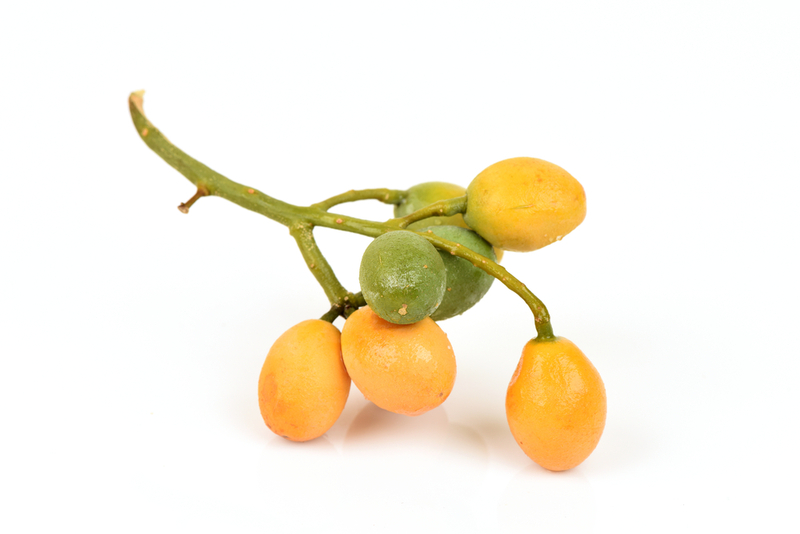 Another advantage to having a coat of DE on your plants at all times, at least for a desert grower like myself, is that during hot, sunny days it also shields plants from the harmful rays of the sun preventing heat stress and sunburnt fruit and vegetables. Here is the DE I sell which is one of the purest, cleanest, most absorptive, and whitest DE’s in the market. 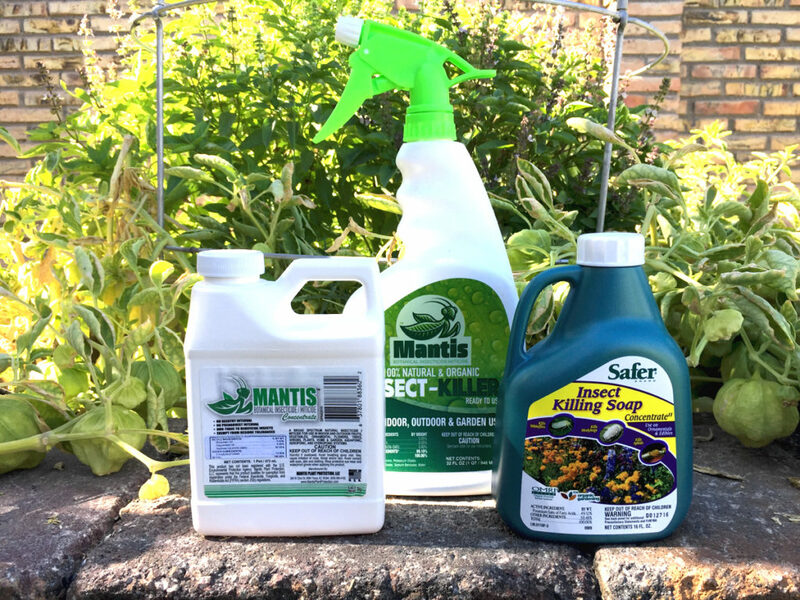 Botanical oils, horticultural oils, and insecticidal soaps are very effective for when pests are present providing quick knock-down control and work best on spider mites and soft bodied insects like aphids, whitefly, mealybugs, and thrips. *They are also effective against powdery mildew. 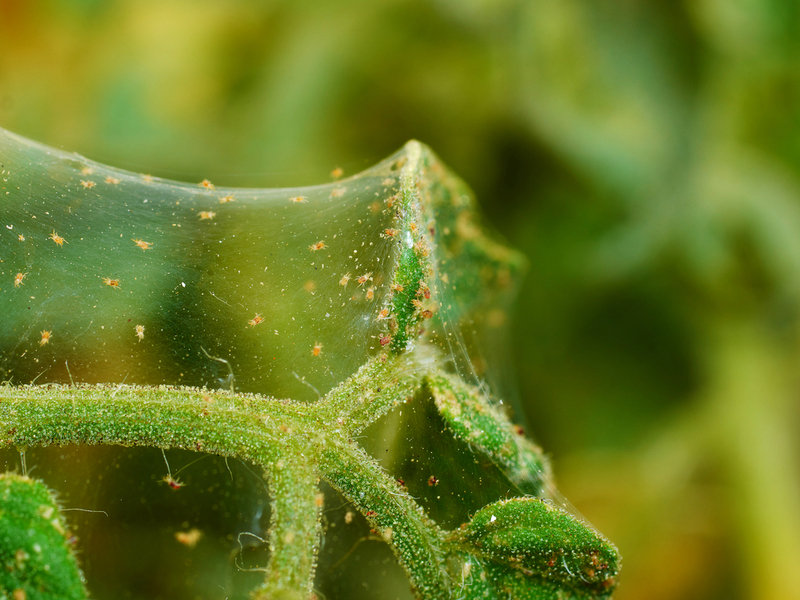 This class of biopesticides use a contact mode of action smothering insects by clogging their spiracles, or breathing pores, and breaking down their outer cellular membrane so in order for them to work properly, they must come into direct contact with target insects or spider mites. This is why its important to achieve excellent coverage, spraying entire leaves, stems, and all plant surfaces and apply at first sign of pest presence and continue applications every 4-7 days. *They can also be effective on insect egg masses by inhibiting oxygen uptake and decreasing hatching success. Botanical oils and insecticidal soaps are a great options for controlling spider mites. Do not use if temperatures are expected to be above 85 degrees fahrenheit. Spray in early morning or evening when it is cooler. 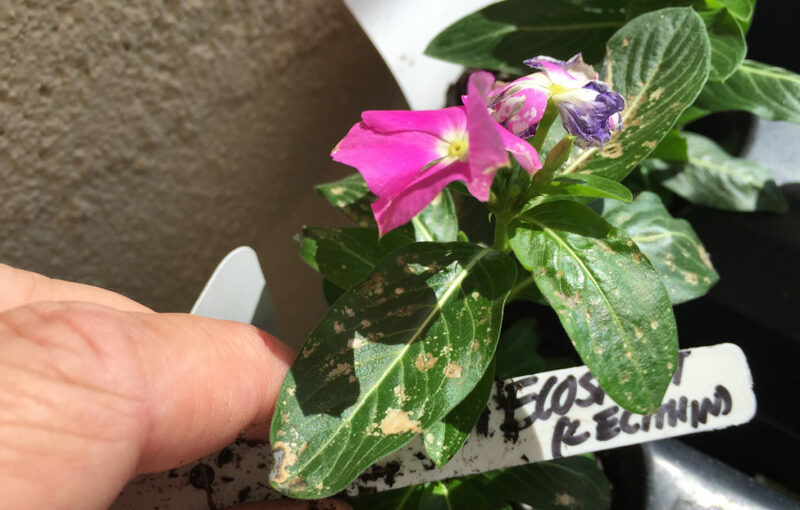 Do not apply in mid-day sunlight or when grow lights are turned on as temporary leaf burn may occur. Do not make more than 3 consecutive applications. (if plants are pounded with multiple applications, sometime the oils and soaps can break down their waxy cuticle and cause damage). Plant Safety: There are some cheap, poorly formulated, botanical oil based products in the market that will burn your plants so be sure to ask around or test before applying to entire garden. 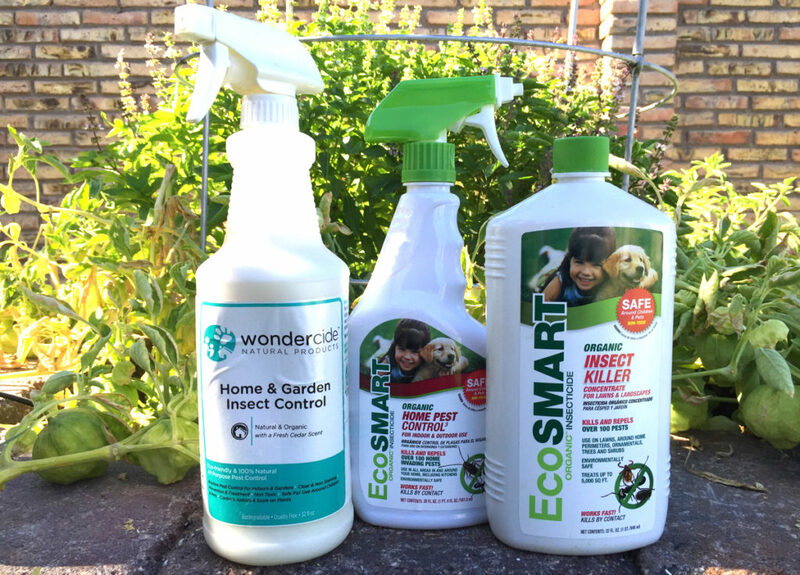 Botanical Oils vs. Insecticidal Soaps? 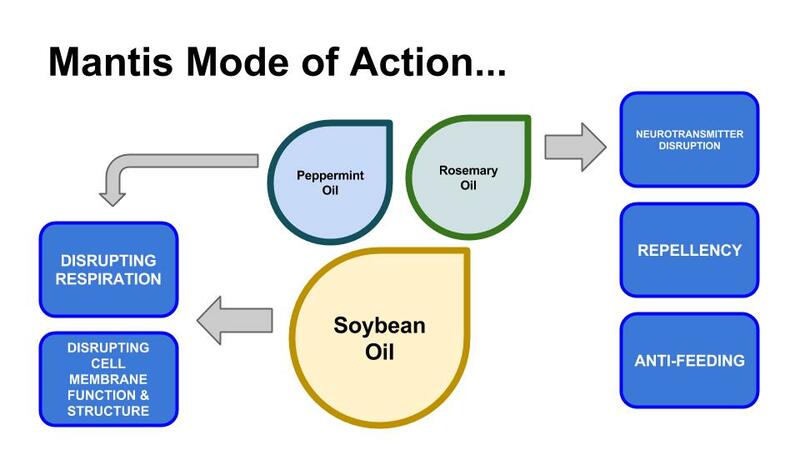 Botanical oil based products, like Mantis Insecticide/Miticide, and insecticidal soaps work in a similar fashion but not quite the same thing. 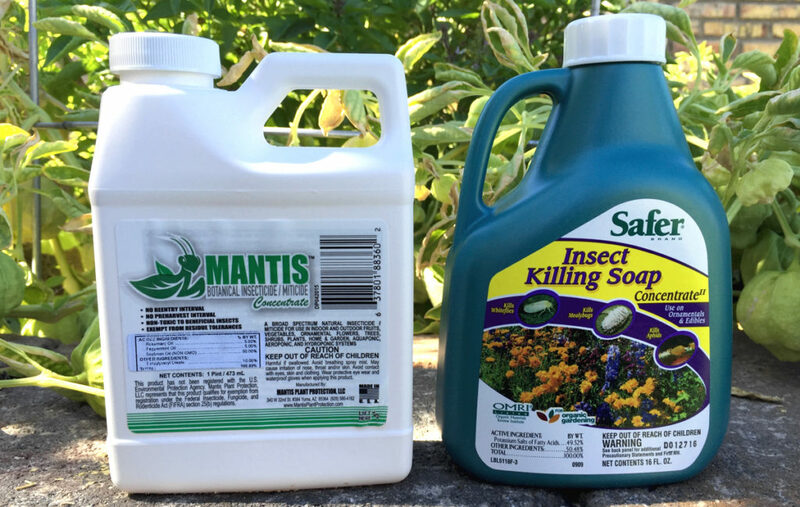 Insecticidal soaps and horticultural oils, like mineral oil, only work by contact, but certain botanical oils, like my very own Mantis EC Botanical Insecticide/Miticide, have multiple modes of action working by contact PLUS repellency and anti-feeding due to the fact it’s formulated with peppermint and rosemary oils. 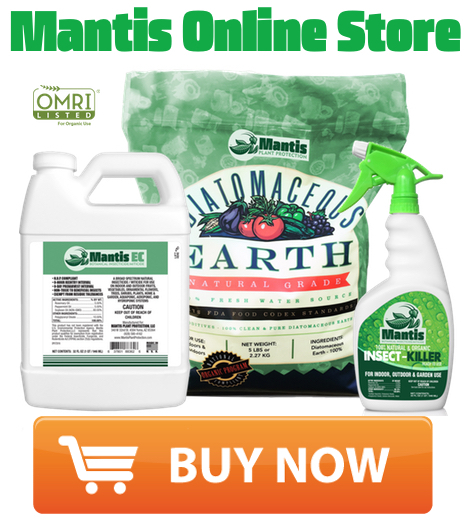 Mantis Botanical Insecticide/Miticide active ingredients and mode of actions break down. On the left is General Hyroponic’s isolated azadirachtin based concentrate and Dyna-Gro’s simpler neem oil. The azadiracthin compound is one of the oldest natural biopesticides in the world that is extracted from the neem tree and was first discovered in India ages ago. Also classified as a botanical insecticide, azadiracthin based products typically come in two forms… 1) the isolated azadirachtin molecule in a formulated product or 2) neem oils. 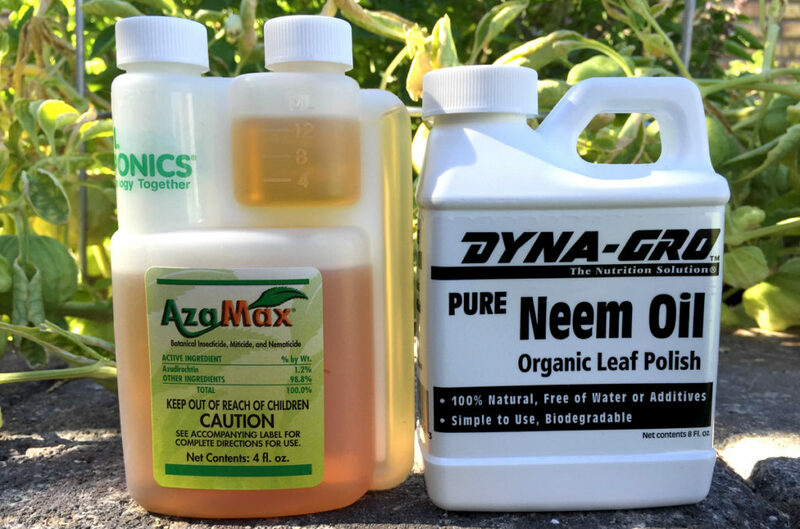 Although neem oils do contain a good amount of azadirachtin compounds and can also be useful for powdery mildew treatments, for insect control I prefer to use products that are formulated using the isolated azadirachtin compound. 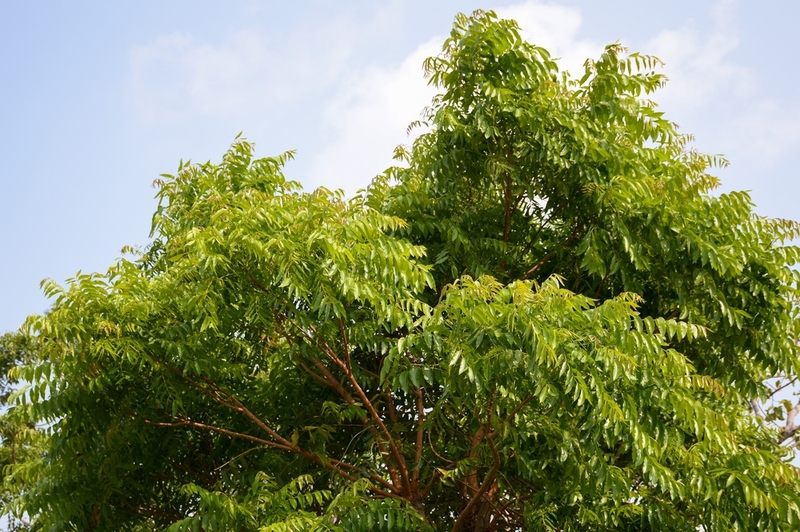 The azadiracthin compound is carefully extracted from neem tree seeds and is the part that has the most insecticidal activity. Neem oils are simply mechanically extracted oils from all the biomass of the neem seed kernals. So they tend to have a less concentration of azadirachtin but are still loaded with natural compounds and can be very useful in your garden. If you do decide to use neem oil, just be sure to use organic 100%, cold pressed neem oil. The cold pressed extraction process preserves all the terpenes and terpenoids that provide insecticidal and fungicidal activity. Azadirachtin compound is extracted from Neem seeds and then isolated for the formulation. 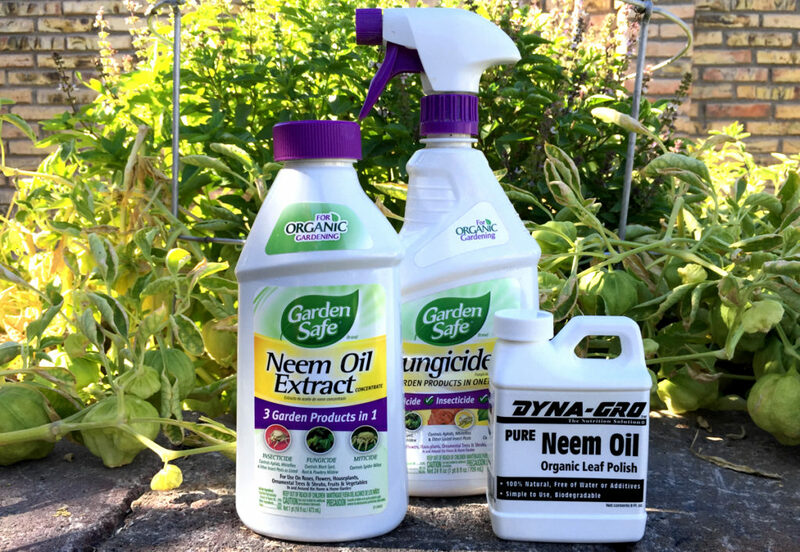 There are many cheap neem oil concentrates and Ready-to-Use sprays available but optimum insect efficacy could be compromised. Azadirachtin is a unique biopesticide as it mainly functions as an insect growth regulator affecting insect’s ability to molt and their growth stages but it also has other modes of action such as repellency and antifeedant properties. Azadiracthin biopesticides are a very good tool to have for insects pests such as aphids, thrips, spider mites, whiteflies, leafminer, caterpillars and worms. There are bacillus thuringiensis (Bt) dusts and powders but you can also use liquid concentrates like Southern’s Ag’s Bt. Bacillus thuringiensis (or Bt) are soil dwelling bacteria that produce crystal proteins that are toxic to certain insects like flies, beetles, gnats, but most notably worms and caterpillars. 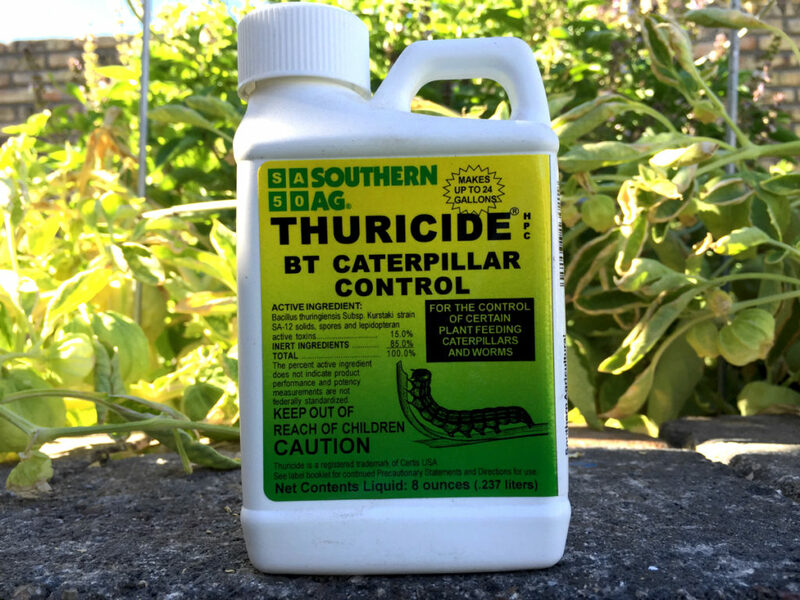 Once worm or caterpillar populations get too big to simply pick off by hand, Bt’s are your first line of defense as it is the organic insecticide most specific to these kind of pests that won’t negatively affect other beneficial organisms. 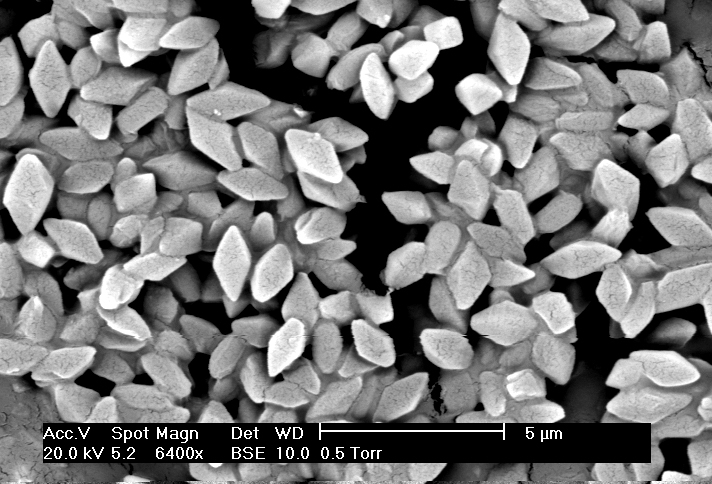 Bacillus thuringiensis spores and crystal proteins. Most people assume the bacillus bacteria itself is what attacks insects but it’s actually the toxic crystal proteins they produce that provide all the insecticidal activity. Unlike most biopesticides that work by contact, Bt’s are actually toxic to worms and caterpillars and can work quite well when applied correctly. When worms and caterpillars feed upon leaf surfaces treated with Bt and ingest the crystal toxins, they stop feeding and eventually die. Bt’s have gotten a bad name over the years with the advent of Genetically Modified Organisms (GMO) like corn and soybean, which have Bt genes engineered into their DNA, but Bt biopesticides are completely different, natural and have nothing to do with genetic engineering. Bt’s have also been proven to be a viable option to control fungus gnats that reproduce in the soil of plant containers. Here is a spinosad concentrate I found works well in my garden. You can also easily find spinosad Ready-to-Use sprays. If Bt’s aren’t getting the job done with your worm or caterpillar infestation, the best natural worm material you can use is spinosad. Although organic and perfectly safe to use around humans and animals, spinosad is an extremely effective insecticide that is highly toxic to many different insects, even some beneficial ones, so you should only use as a last resort. However it is the most powerful organic insecticide in the market and a great tool for hard to kill pests such as worms, caterpillars, thrips, and even leafminer. Spinosad is translaminar, meaning it is absorbed through the leaf profile, which is why it works well on leafminer larvae that feed underneath the leaf surface. Similar to Bt insecticides, spinosad is a natural substance produced by a specific soil bacteria but works by affecting the nervous system of insects that eat or touch it. Again, use with care but when you need to take care of a serious thrips, leafminer, worm or caterpillar problem quick, spinosad is the closest thing to a silver bullet you’ll find among organic pesticides. However use sparingly, unlike the other organic pesticides discussed, insects can actually build-up a resistance against spinosad so do not make more than 2 consecutive applications without switching to a pesticide with a different mode of action. *Also the best organic material to control Spotted Wing Drosophila. For more technical information on spinosad click here. 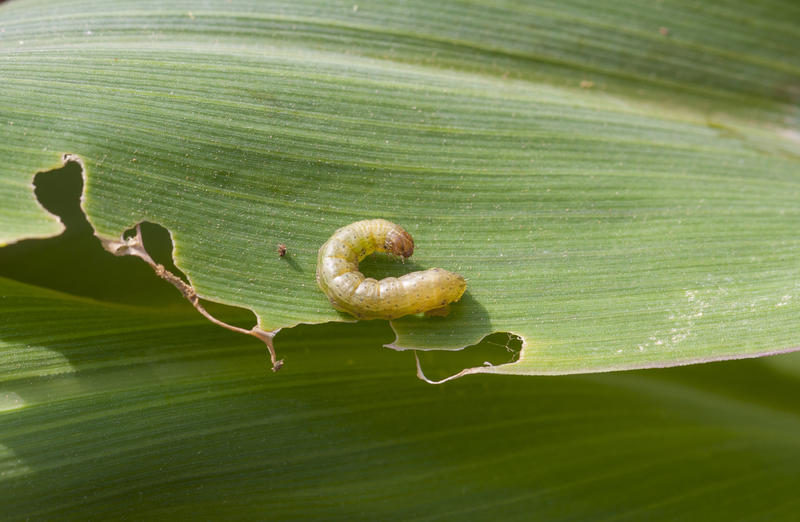 For caterpillars and other lepidopteran pests like this armyworm… if you have a small area you can simply pick them off by hand; but if you need to spray start with Bt as it will have less an impact on beneficial insects; if that doesn’t work move onto a spinosad based product which will smoke them. 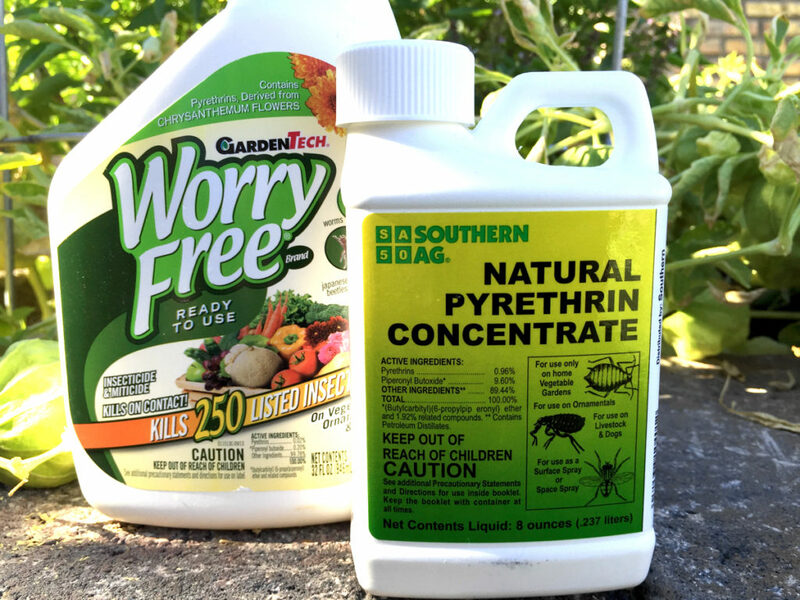 Garden Tech’s pyrethrin based, cheap, ready to use spray I picked up at Walmart (which while writing this post I discovered is poorly formulated and burned my pepper plants) and Southern Ag’s much more plant friendly pyrethrin concentrate. Pyrethrins is another botanical, natural pesticide that is extracted from chrysanthemum flowers. Pyrethrins are toxic to a wide range of insects affecting their nervous system when they touch or eat it. 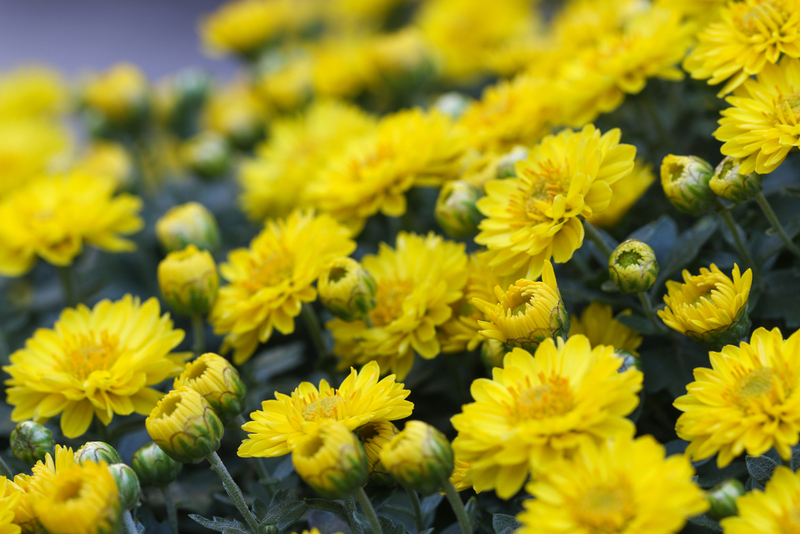 Pyrethrins are pesticides found naturally in certain chrysanthemum flowers like these. Pyrethrins are highly toxic to bees exposed to direct treatment on blooming plants or weeds. Do not apply pyrethrins or allow it to drift to blooming crops or weeds while bees are active and present. Pyrethrins are toxic to aquatic organisms, including fish, so do not spray close to water. 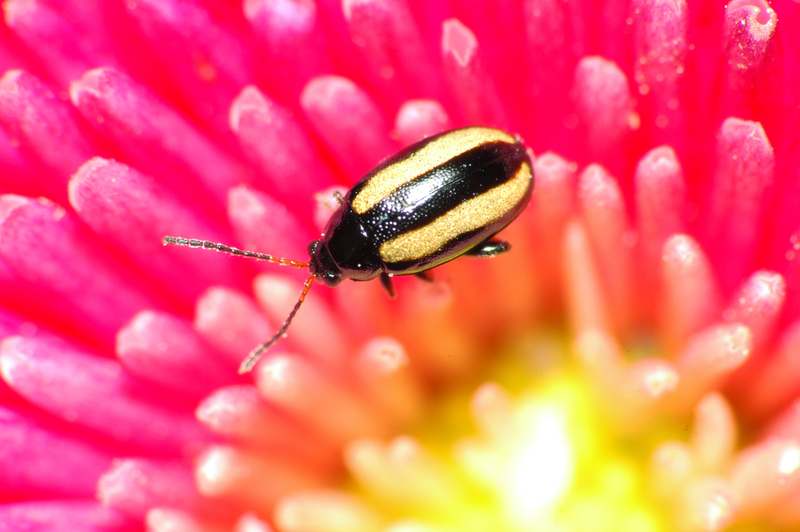 Like spinosad, insects will develop a resistance to pyrethrins if used irresponsibly. Do not make more than 2-3 consecutive applications without rotating with a pesticide of a different mode of action. Even though pyrethrins is a natural insecticide that is fairly safe to use and handle, as you can see it is still considered toxic to many different insects, good and bad, and you’ll want to use it sparingly and only when necessary. Pyrethrins will have a broad range of activity on many different insects but I like to use it on some of the hard shelled, tough to kill insects like beetles. For example, Japanese beetles and flea beetles are extremely tough insects to control organically but with good coverage and contact, pyrethrins works pretty well. Pyrethrins are a good organic option to control hard shelled insects like these Japanese beetles. Pyrethrins another good tool for these hard-bodied, very mobile flea beetles. Pyrethrins is also a good option for highly mobile flying insects like fruit flies, gnats, mosquitos, and your common house fly. For more technical information on pyrethrins and it’s environment impact, click here. Make applications in the early morning or evening hours. (Many organic pesticides are sensitive to heat and UV light and will break down when exposed to the sun for too long. Also applying at these times reduces the risk of burning your plants). 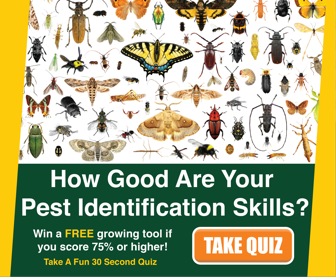 Plant Safety: Always test biopesticides before spraying entire garden. 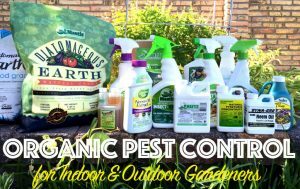 One major risk with using organic pest control products, is that some of them are cheap and poorly formulated burning your plants after a single application. This is the sort of leaf burn damage you’ll see after treating with a poorly formulated biopesticide… not good! 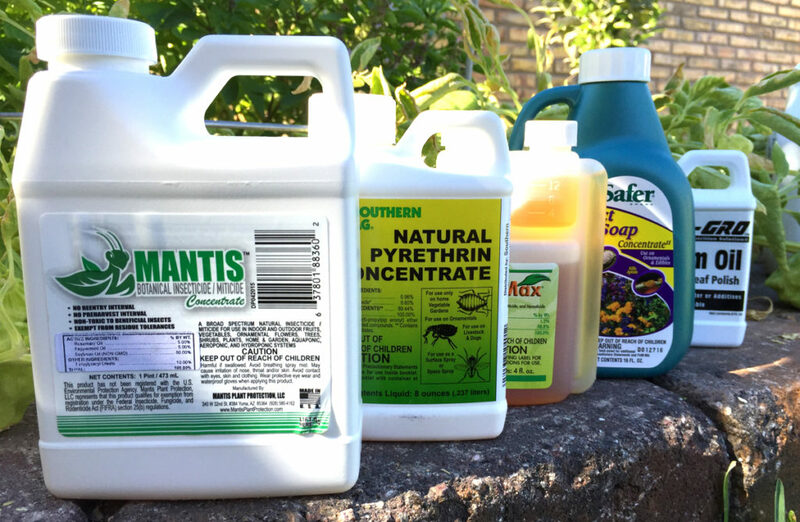 Here are just a few organic insecticides I’ve tested that will cause leaf burn but beware… there are a lot of junk products out there in the market so test before using. Most organic pesticides need to come into direct contact with insects in order to work properly so make sure you get really good coverage when applying, covering all plant surfaces. (top and bottom of leaves, stems, basically everywhere). When possible, use an organic adjuvant to increase coverage and penetration. After mixing biopesticide concentrates in water, apply as soon as possible because over time water can degrade the activity of the ingredients and decrease their effectiveness. Although Ready-to-Use sprays are more convenient and easier to use, concentrates are a better bang for your buck and will last a lot longer. (Also, you cut down on your annual plastic consumption). 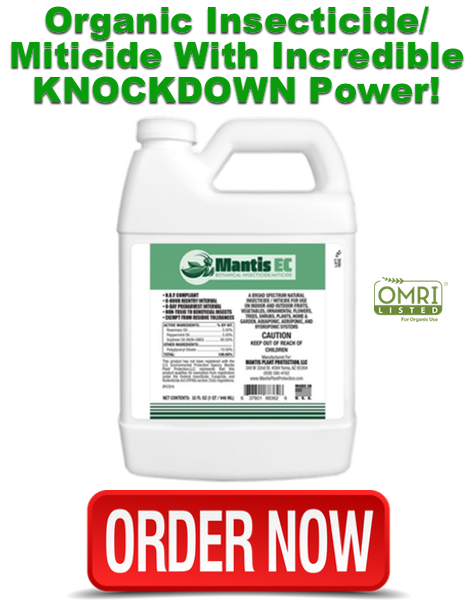 Most ready to use sprays are 24-32 ounces of spray solution, but some pint concentrates, like my Mantis EC, will make 16-32 GALLONS of spray solution for just a few bucks more… think about it. If you’re a serious grower, concentrates are a better bargain, will last longer, easier to store, better control over rates, and will have a longer shelf life than water based products. 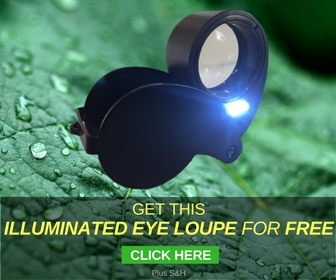 PS: If you’d like for me to send you a $20 Mantis Hand Lens for FREE, click here. 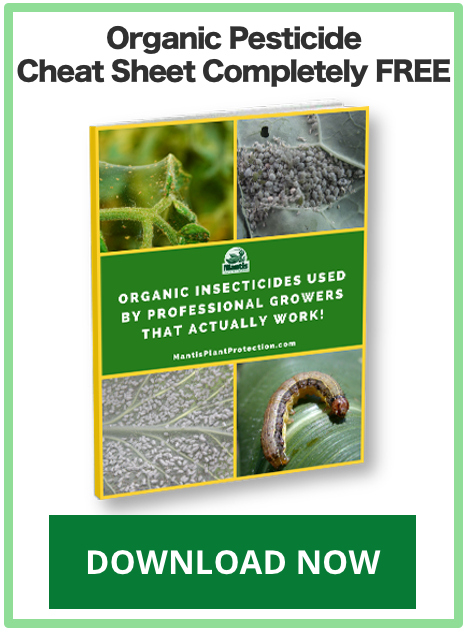 I am the founder of Mantis Plant Protection and also a certified pest control adviser working with organic growers throughout Southern California, Arizona, and Mexico.